This green and black powerhouse detox blend combines charcoal, clay, willowherb, aloe vera and kale extract. Wear it as a mask, then massage to loosen all the rest of the junk hiding out on your beautiful skin ready to wreak havoc. Suitable for all skin types. Aqua, kaolin (clay), bentonite (clay), glycerin, epilobium angustifolium (willowherb) leaf extract, charcoal, brassica oleracea acephala leaf (kale) extract, camellia sinensis (green tea) extract, xanthan gum, aloe barbadensis leaf juice, potassium sorbate, moringa oleifera seed oil, undaria pinnatifida extract, fucus vesiculosus (bladderwrack) extract, cucumis sativus (cucumber) fruit extract, panthenol, methyl lactate, phenoxyethanol, ethylhexylglycerin, parfum (natural). Apply a thick layer to skin. Let it sit for 5-10 minutes. Rinse well. Follow with moisturiser. Patch test before use. 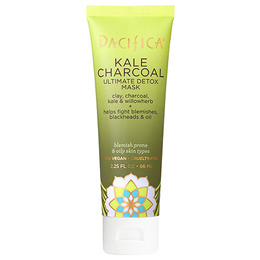 Below are reviews of Pacifica Kale Charcoal Ultimate Detox Mask - 66ml by bodykind customers. If you have tried this product we'd love to hear what you think so please leave a review. 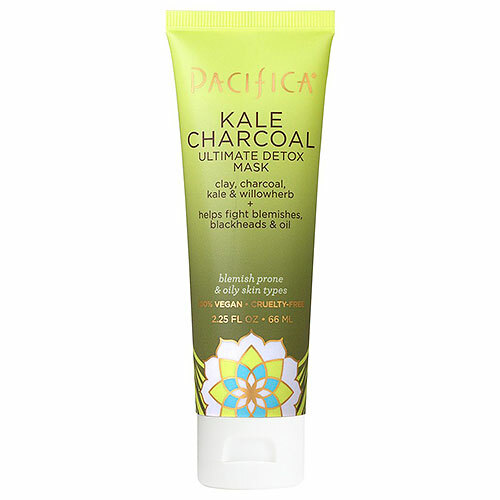 This green and black powerhouse detox blend combines charcoal, clay, willowherb, aloe vera and kale extract. Wear it as a mask, then massage to loosen all the rest of the junk hiding out on your beautiful skin ready to wreak havoc.